In 2011, Canada’s national unemployment rate was 7.4%. Newfoundland and Labrador experienced the highest rate of unemployment (12.7%), followed by PEI at 11.3%. Rates for Manitoba (5.4%), Saskatchewan (5.0%) and Alberta (5.5%) fell below the national average. 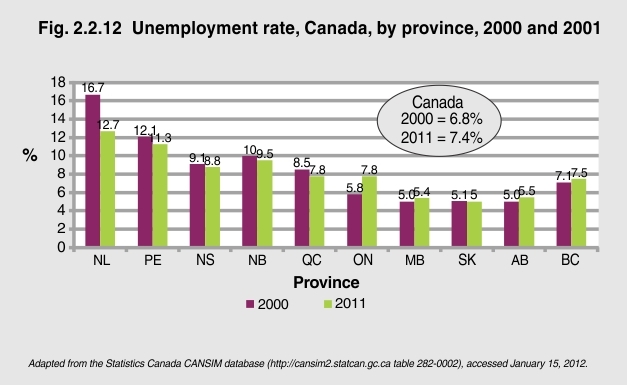 Newfoundland and Labrador’s unemployment rate improved in 2011 compared to 2000 (16.7%), while Ontario’s unemployment rate rose from 5.8% in 2000 to 7.8% in 2011. Being unemployed means there are fewer financial resources to meet the needs of the family. The duration of employment also plays an important role in the well-being of the family. Although the Atlantic region had the highest unemployment rates among the provinces, Quebec, Ontario and British Columbia had the highest average weeks spent unemployed (23, 22 and 21 weeks, respectively)1. To safeguard vulnerable communities from economic collapse during difficult times, leaders need to initiate profitable, sustainable development that can provide a safety net for the labour force. 1Statistics Canada, 2011. CANSIM Table 282-0048 – Labour force survey estimates accessed at http://www5.statcan.gc.ca/cansim/a26?lang=eng&retrLang=eng&id=2820048&paSer=&pattern=&stByVal=1&p1=1&p2=-1&tabMode=dataTable&csid=on January 15, 2012.